Changes in aggregate demand always result in unemployment going one way, while inflation goes the other, at least in the short run. We saw this on the previous page, where a decrease in AD caused an increase in unemployment, but a decrease in the price level, and an increase in AD caused the opposite. Changes in aggregate supply push inflation and unemployment in the same direction at the same time. If the shock is positive, shifting AS to the right, this is very, very good since both inflation and unemployment fall. But if the shock is negative, shifting AS to the left, the output is not good since both inflation and unemployment rise. This is stagflation, which happened during the 1970s. In the latter case, there is no good policy option since an expansionary fiscal or monetary policy while lowering unemployment would make inflation worse. A contractionary fiscal or monetary policy could reduce inflation, but cause greater unemployment. Figure 1. Effects of a Negative Supply Shock. Figure 1 illustrates the effects of a rapid increase in the price of oil. This negative real shock would cause the LRAS to shift to the left, which causes not only a decrease in GDP, but an increase in inflation. These two issues (recession and high inflation) typically require opposite policies from the Fed. To decrease inflation, the Fed could decrease the money supply and reduce aggregate demand, but that would only make the recession deeper. Or they could increase real output by decreasing interest rates, stimulating aggregate demand, but that would likely cause even higher inflation. This is precisely why there is no easy answer to this situation. 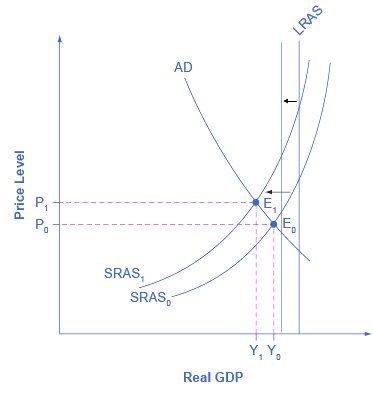 Negative real shocks are more complicated than shocks to aggregate demand. A real-life example of this occurred in the 1970s. The recession of 1974-75 was caused by adverse supply shocks, primarily the Oil Crisis which occurred when the Arab members of the Organization of Petroleum Exporting Countries (OPEC) embargoed petroleum exports, driving up the price of oil. Since oil is used in the manufacturing of most goods and services, this was a very large supply shock. This recession was, at the time, the worst economic downturn since the Great Depression. The Federal Funds Rate peaked in mid-1975 as the Fed aggressively cut interest rates to stimulate aggregate demand and reduce unemployment. The Ford Administration conducted an expansionary fiscal policy, driven largely by tax cuts, which you would expect from a Republican (and thus neoclassical) administration. The economy recovered, but inflation went even higher, peaking at nearly 14% in mid-1980. Watch the clip from this video to better understand what happened with stagflation during the 1970s economic crisis, as well as the policies taken by the Fed to put an end to rising inflation. Neoclassical economists believe that the economy will rebound out of a recession or eventually contract during an expansion because prices and wage rates are flexible and will adjust either upward or downward to restore the economy to its potential GDP. Ironically, the Ford Administration’s aggressive fiscal stimulus policy was perhaps not what you would expect; but sometimes politics overrides theory. Thus, the key policy question for neoclassicals is how to promote growth of potential GDP. We know that economic growth ultimately depends on the growth rate of long-term productivity. Productivity measures how effective inputs are at producing outputs. We know that U.S. productivity has grown on average about 2% per year. That means that the same amount of inputs produce 2% more output than the year before. We also know that productivity growth varies a great deal in the short term due to cyclical factors. It also varies somewhat in the long term. From 1953–1972, U.S. labor productivity (as measured by output per hour in the business sector) grew at 3.2% per year. From 1973–1992, productivity growth declined significantly to 1.8% per year.hen, from 1993–2014, productivity growth increased slightly to 2% per year. The neoclassical economists believe the underpinnings of long-run productivity growth to be an economy’s investment in human capital, physical capital, and technology, operating together in a market-oriented environment that rewards innovation. Promotion of these factors is what government policy should focus on. Keynesian economists also support policies to promote economic growth, but not to the exclusion of countercyclical policies–those that try to diminish the fluctuations of business cycles. Most Republican administrations favor tax cuts to promote economic growth. We saw this with the Ford administration, but it was also a large motivation for the Reagan tax cuts. Democratic administrations are more likely to support increases in government spending on education and infrastructure investment. The economic boom of the 1990s was driven by private investment as the Internet became increasingly available. Credit should also go to public investment in research and development (R&D) that started in the late-1970s and 1980s. The decline in public R&D spending during the1990s probably contributed to the less impressive economic performance of the 2000s. While the Clinton Administration failed to achieve its health care reform goals, it did manage to boost the Head Start program, which provides preschool for low income children. Fiscal policy was also moderately contractionary as budget deficits became budget surpluses, in part as an attempt to reduce the likelihood of crowding out which would limit private investment and future economic growth. Keynesian economists believe that the costs of allowing the economy to recover from recessionary and inflationary gaps are too high, that it’s preferable to actively manage the economy. By contrast, Neoclassical economists do not believe in “fine-tuning” the economy. Neoclassicals prefer to focus policy on economic growth. They think that economic growth is fostered by a stable economic environment with a low rate of inflation. Similarly, tax rates should be low and unchanging. In this environment, private economic agents can make the best possible investment decisions, which will lead to optimal investment in physical and human capital as well as research and development to promote improvements in technology. Keynesians also believe in promoting economic growth, but they favor government investment in infrastructure, a form of government spending, as well as both direct spending and tax cuts to promote research and development, and spending on human capital, that is education, both K12 and higher education. a. What will happen to wages, costs, and aggregate supply if no policy is implemented? Wages will decrease, costs will decrease, and aggregate supply will eventually shift to the right in the long run. b. How could fiscal policy be used to combat the recession? Government spending could increase, causing aggregate demand to increase OR a tax cut could result in more disposable income, which would increase consumption, and cause a shift to the right in the AD curve. c. How could monetary policy be used to combat the recession? The Fed can increase the money supply, which would decrease interest rates and increase investment and consumption, which will increase AD and shift the AD curve to the right. d. How would the Fed change the reserve requirement to combat a recession? The Fed would lower the reserve requirement, allowing banks to create more money. e. How would the Fed change the discount rate to combat a recession? The Fed would lower the discount rate and loan out more money to banks. f. How would the Fed use open market operations to combat a recession? The Fed could sell bonds, putting money into the money supply. Now consider these exact same questions, but apply them to an inflationary gap. Wages will increase, costs will increase, and aggregate supply will eventually shift to the left in the long run. b. How could fiscal policy be used to combat inflation? Government spending could decrease, causing aggregate demand to decrease OR a tax hike could result in less disposable income, less consumption, and cause a shift to the left in the AD curve. c. How could monetary policy be used to combat inflation? ]The Fed can decrease the money supply, which would increase interest rates and lower investment and consumption, which will lower AD and shift the AD curve to the left. d. How would the Fed change the reserve requirement to combat inflation? The Fed would raise the reserve requirement. e. How would the Fed change the discount rate to combat inflation? The Fed would raise the discount rate. The Fed could sell bonds.